U.K. Parliament Rejects May's Revised Brexit Deal With The EU The vote was the prime minister's second chance to gain approval of the terms she struck with the EU for the U.K.'s exit on March 29. Parliament will now vote on whether to leave without any deal. 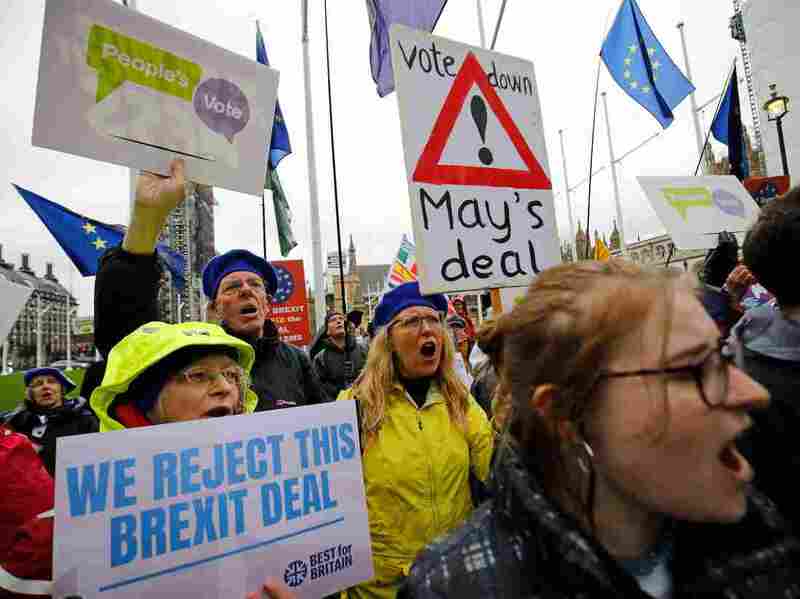 Anti-Brexit activists hold placards and wave flags as they demonstrate outside the Houses of Parliament in London on Tuesday, ahead of a crucial vote on Prime Minister Theresa May's Brexit deal. "I profoundly regret the decision that this House has taken tonight," May said after the vote, which was one of the government's largest defeats in the modern era. "I continue to believe that by far the best outcome is that the U.K. leaves the EU in an orderly fashion with a deal, and that the deal we have negotiated is the best, and indeed the only deal available." Labour Party leader Jeremy Corbyn said that the government "must accept its deal is clearly dead and does not have the support of this House." "The Prime Minister has run down the clock and the clock has been run out on her," he said, amid a raucous Parliament. "It's time that we have a general election and the people can choose who their government should be." The defeat brings much closer the possibility of Britain either leaving the EU without a deal or conducting a second referendum on Brexit. The EU's chief negotiator, Michel Barnier, said in a tweet that "The EU has done everything it can to help get the Withdrawal Agreement over the line. The impasse can only be solved in the UK. Our 'no-deal' preparations are now more important than ever before." As the clock ticked down toward Tuesday's vote, it became all but certain that May's plan did not have the votes it needed to pass. An allied party from Northern Ireland and pro-Brexiteers from within May's own Conservative Party had both signaled they would not support her. The vote was a second attempt for May to gather the approval of Parliament on the terms by which Brexit will occur. Britain's departure from the EU is scheduled to happen March 29, but it's not clear now how or even whether that will occur. As she tried to round up the votes she needed, May implored members of Parliament to consider the consequences of rejecting the deal. "Tonight, members of this house are faced with a very clear choice: vote for this deal, in which case we leave the European Union with a deal," May said Tuesday, her voice hoarse. "Or risk no deal, or no Brexit." This Week Will Mark A Turning Point For Britain And Brexit. Really! Less than 24 hours before the vote, May flew to Strasbourg, France, to meet with European Commission President Jean-Claude Juncker to hammer out enough changes to the deal to secure its approval from Parliament. In January, Parliament dealt the initial version of May's deal a resounding rejection: 432 votes against, and just 202 for. It was the largest defeat for a British government in Parliament in modern times. May had called the revised deal "improved" following her meetings with Juncker, and she said that while members of Parliament would still have concerns, real progress had been made. "There is only one certainty if we do not pass this vote tonight. And that is that uncertainty will continue for our citizens and our businesses." But Corbyn said that nothing of substance had changed, calling May's revised deal "a blindfold Brexit." The agreement's prospects further dimmed Tuesday morning when U.K. Attorney General Geoffrey Cox offered his assessment of the revisions. He said the updated deal reduced the risk of Britain getting locked inside EU regulations but did not eliminate it. To some Parliamentary observers, the proceedings sounded a death knell not only for May's plan — but perhaps her leadership. Tory benches embarrassingly only half full for the PM’s speech, she’s losing her voice badly again, and it’s tipping it down outside. May’s Premiership has an end of days feel to it today. With less than three weeks until the March 29 divorce, two more votes will determine what happens next. A vote Wednesday will ask Parliament: Do you want to leave the E.U. on March 29 without any deal in place? Many fear the chaos that option could bring, and few members of Parliament are likely to vote in favor of it. May said Wednesday's vote will be a "free vote" — one in which members of Parliament are not put under pressure by party leaders to vote a certain way. Such votes are traditionally permitted on issues seen as matters of conscience. If the no-deal vote fails, Parliament is expected to vote Wednesday or Thursday on a measure that would ask the EU to give the U.K. more time to figure out a plan. That extension could be as short as three months or as long as two years. It's not clear whether the EU would approve an extension – that would need to be approved unanimously by all 27 of its remaining member nations. After the vote, May warned that the EU would need to know why more time would help Britain out of its impasse. The U.K. has been in political chaos since British voters approved leaving the EU in June 2016. More than two years later, whether Britain will actually leave is in doubt — but it's clear that the political casualties are only beginning.